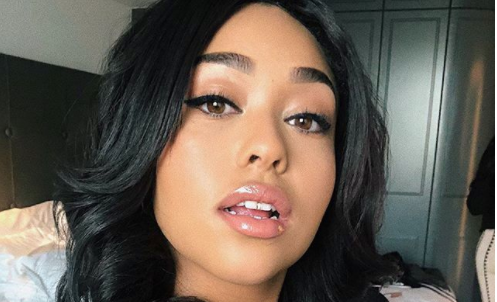 Jordyn Woods has been missing in action ever since she was accused of sleeping with Khloe Kardashian’s beau, Tristan Thompson. According to TMZ and The Daily Mail, the Cleveland Cavaliers Power forward was allegedly seen in the company of Thompson at an afterparty on Sunday, Feb. 17, 2019. Now the report is old news, however, it is important to set the stage once again so that one can understand why Woods might have been hiding from public view and yet now has decided resurfaced. As the story goes, the basketball player was seen making out with Woods at an afterparty hosting by Thompson in his home. Woods does not deny the kissing, however, she vehemently denies sleeping with Thompson, confessing that she only kissed the Basketball star after leaving his home at approximately 7 a.m. the morning after the party. Mind you there are reports from E! that claim Thompson prohibited cell phones at the party. This, according to witnesses permitted the two to cuddle for hours on the basketball player’s couch. In the mist of all of this drama, Jordyn Woods ruined her friendship with Khloe’s half sister, Kylie Jenner. Jenner and Woods once had an inseparable friendship. However, TMZ reported a few days ago that Jenner had given on making up as a result of Woods sleeping with her sisters beau. After the cheating scandal went public, Woods hid out of public sight. Rumors suggest that she was afraid of losing her high profile collaboration with cosmetic company Eyelure lashes. Jordyn’s comeback has been deliberately gradual as her celebrated friendship with Jenner collapsed in early March. Jordyn is not to be blamed for the breakup of my family. This was Tristan’s fault… I’m a rollercoaster of emotions & have said things I shouldn’t have. Honestly, Tristan cheating on me & humiliating me, wasn’t such a shock as the first time. It appears that knowing Khloe was not out for revenge may have helped clear the way for Jordyn to once again appear in public. Still, the wound is quite fresh as TMZ’s recent video shows an army of paparazzi taking pictures and asking her who is going to be your new BFF.